POMONA, CALIF.(September 15, 2010) – Off-Road community members, racers, volunteers and companies in partnership with the Bureau of Land Management will gather on Saturday, October 9, at 10:30 a.m. at the 2010 Lucas Oil Off-Road Expo for the unveiling of the California 200 Memorial Monument, a large scale statue designed to honor the victims of the recent desert race accident where eight were killed and 12 injured. The 2010 Lucas Oil Off-Road Expo will invade the Pomona Fairplex Saturday, October 9 through Sunday, October 10, with everything off-road including new vehicles, thousands of parts and accessories, ATV test rides, freestyle motocross action and more. The monument is comprised of steel and concrete and is in the final building stages. The public can all make their mark on the monument as well in the form of a wall available for all to sign and show their support for victims and their families. After the public unveiling on Saturday, October 9, at 10:30 a.m., the statue and the wall will remain on display throughout the weekend at the expo and then both will be placed permanently at the desert crash site. The Lucas Oil Off-Road Expo has also named FAST-Aid the official charity for the 2010 event. FAST-Aid is a non-profit organization dedicated to providing financial, educational and personal assistance to injured off-road racers, support teams and their families following a motor sports racing incident. “To assist in the fundraising efforts for victims, one dollar from each 2010 Lucas Oil Off-Road Expo ticket purchased at www.offroadexpo.com with discount code FAST-AID will be donated to Fast-Aid,” said Gattuso. “In addition, any online ticket buyer will have the opportunity to make further donations to Fast-Aid at the completion of the ticket purchase process at www.OffRoadExpo.com for any amount they choose.” For more information on FAST-Aid visit www.fast-aid.org. This year’s expo showcases all the latest off-road toys, technologies, parts, gear and accessories from more than 300 of the industry’s leading manufacturers, dealers and distributors. Off-road manufacturer representatives will be on-site to demonstrate and educate attendees on all the latest vehicles and accessories. In addition to the line-up of trucks, Jeeps, UTVs, ATVs, side-by-sides, dirt bikes, sand rails, rock crawlers, parts and accessories on display, the Expo will come to life with exciting entertainment features including: all new Lucas Oil Off-Road Racing Exhibition will feature high powered, high jumping race trucks on a closed-circuit course; freestyle motocross Can-AM ATV test drives on the Can-AM/BRP Commander Demo Course, professional RC Car racing; celebrity appearances; live music; bikini contests; and more. 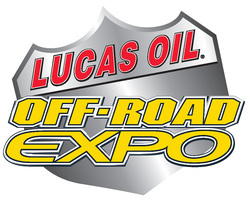 The 2010 Lucas Oil Off-Road Expo will take place Saturday, October 9, from 9 a.m. to 6 p.m. and Sunday, October 10, from 9 a.m. to 5 p.m. Held at the Pomona Fairplex, located at 1101 W. McKinley Avenue in Pomona, Calif., Advance tickets can be purchased at O’Reilly Auto Parts / Kragen Auto Parts or online $10 for adults, $5 for children (6-12). Tickets purchased on-site at the gate will be $12 for adults, $5 for children (6-12) and free for children under six. A Family Four Pack is available for $20 and includes admission for two adults, and two children (available online only). For more information and to purchase advance tickets, visit www.offroadexpo.com. Racers Helping Racers-Spread the Word!